FILE - A photovoltaic solar park situated on the outskirts of the coastal town of Lamberts Bay, South Africa, March. 29, 2016. Strong demand is set to give a huge boost to renewable energy growth in sub-Saharan Africa over the next five years, driving cumulative capacity up more than 70 percent, a senior international energy official said Wednesday. From Ethiopia to South Africa, millions of people are getting access to electricity for the first time as the continent turns to solar, wind and hydropower projects to boost generation capacity. 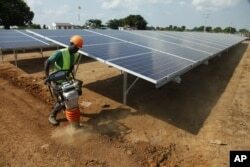 FILE - A Ugandan worker builds a solar plant in Soroti, about 300 kilometers east of Kampala. "A big chunk of this [growth] is hydro because of Ethiopia, but then you have solar ... in South Africa, Nigeria and Namibia and wind in South Africa and Ethiopia as well," said Paolo Frankl, head of the renewable division at the Paris-based International Energy Agency. He forecast installed capacity of renewable energy in the Sub-Saharan region almost doubling — from around 35 gigawatts now to above 60 gigawatts, given the right conditions. Ethiopia has an array of hydropower projects under construction, including the $4.1 billion Grand Renaissance Dam along the Nile River that will churn out 6,000 megawatts upon completion. That is enough for a good-sized city for a year. "Africa has one of the best potential resources of renewables anywhere in the world, but it depends very much on the enabling framework, on the governance and the right rules," Frankl told Reuters on the sidelines of a wind energy conference. The transition to a low-carbon trajectory to reduce harmful greenhouse gases is creating opposition from the coal industry and fueling uncertainty in countries where job creation was linked to coal mining. FILE - The cooling towers at Eskom's coal-powered Lethabo power station are seen near Sasolburg, South Africa. In Africa, this tension and its impact on new investment has been best illustrated by South Africa's state-owned Eskom and its reluctance to sign new deals with independent power producers, according to analysts. In May, the South African Wind Energy Association (SAWEA) said the energy regulator agreed to investigate Eskom's refusal to sign agreements that delayed 2,942 megawatts in new solar and wind projects. "Our government does not appear to appreciate the forces of nature," SAWEA Chairman Mark Pickering said Wednesday. The inability of Eskom to sign the new power purchase agreements for two years has delayed investment of 58 billion rand ($4.03 billion), and hit investor confidence with at least one shutdown of a wind turbine manufacturing plant, said SAWEA. "The continent has a lot of potential, but the problem is financial and political issues, so all of our projects are being delayed for quite a long time, like with Eskom," said Mason Qin, business development manager for southern and eastern Africa at China's Goldwind.